She understood it was a stumbling block. Not only had she had frank discussions with her accountant, but she had spent considerable time and money attending events, reading blogs and websites, and even purchased a few online marketing courses. But the additional marketing ideas hadn’t increased her sales. We talked more about her business and an interesting pattern showed up. She shared the details from her first launch. In her eyes, she failed. She hosted a big event to showcase her business launch but didn’t land a single sale. After this disappointment, she thought she wasn’t good at consulting and focused on finding “success” in other ways like growing a large social media tribe. I asked her to consider another approach and analyze her existing social media followers. By analyzing the trends, I thought she might uncover some hidden gems. A gems that might translate into a product her community wanted her to sell. Plus I thought it would be a double boost to her confidence to see what was making an impact to her people. We spoke again a few months later and she shared that she landed a few prospects as a result of this insight. And I was even more excited for her to hear her confidence in her voice. She was ready to dive back in and start finding sales opportunities. 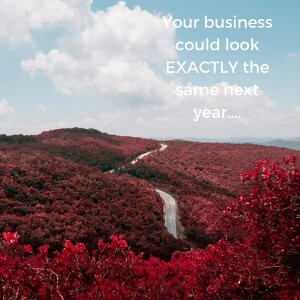 Running a solo business can be challenging. There are a ton of roadblocks, challenges, and obstacles along the path. It becomes super seductive and “easy” to squirrel away and read all of the free advice online or sit in classes trying to figure out your solutions. But that may not get at the heart of the problem. You might have to get really vulnerable. Open yourself up honestly about where the root of the problems exist. And hear some ideas, tips and strategies that are counter to your original ideas. And yes, that is going to require a shift. A shift in mindset. A shift in your habits. A shift in your patterns. Something that might sound hard to adjust to when you first hear it. But will become powerful when you implement it. I can remember one of the first times I experienced this. Several years ago, I received powerful advice to start blogging. Before I nailed my topic. Before I knew exactly every nuance of how to operate WordPress. The goal was to start and pay attention to what my audience resonated with. That flew completely counter to my training to have my ducks lined up first before exploring a project. I had to dive in and be willing to make mistakes along the way. In a more public way than I was adjusted to. But the advice and next steps – powerful. I gained key insights into the topics that connected the most. And also learned the areas to avoid. So I encourage you to consider this shift. Be willing to lay it all out on the table. Take small steps once you get insights and information on what to change. If you are willing to invest in the overall health of your business instead of the overnight solutions, you will reach the promised land of your dreams and goals!